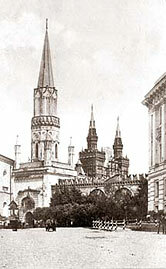 - and a huge section of post-revolutionary painting, sculpture and graphic arts located in the Crimea embankment annex. First third of the 12th century. St. Demetrius of Thessalonica and others. 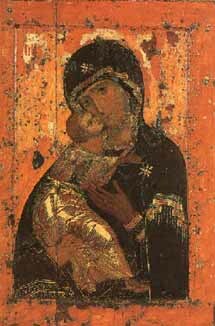 Some of them were brought to Rus from Byzantium (The Virgin of Vladimir), other were belonged to purely Russian artistic schools in Kiev, Novgorod, Yaroslavl and Suzdal. The greatest artist of old Russian art in the 15th and 16th century was Andrei Rublev succeeded in not only achieving a high degree of perfection and spirituality in his art, but also in expressing the most important ideals of life contemporary to him. His famous "Trinity", dedicated to the memory of the great champion of Russian unity, St. Sergius of Radonezh, is the embodies symbol of the ideals of spiritual unity, all-encompassing love and self-sacrifice. 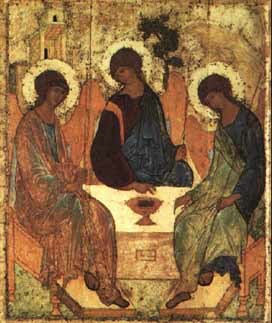 The "Trinity" is exposed in the Tretyakov Gallery. From the early eighteenth century during Peter the Great's era, Russian art gradually loses its former almost exclusive religious orientation and takes on a distinct secular character. The style of Russian painting changes dramatically: artists begin to show visible world as three-dimensional image. Painting technique also changes: paintings are executed primarily in oil color on canvas, while the main materials of old Russian icons were wood panels and egg tempera. 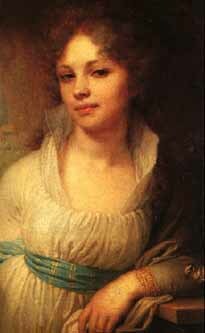 The greatest achievements of eighteenth-century Russian painting are connected with the portrait genre. The portrait painters Fyodor Rokotov, Dmitriy Levitsky and Vladimir Borovikovsky constitute the glory of Russian eighteenth-century art. The customary stylistic categories of Baroque, Rococo and Classicism do not really apply to their paintings, although elements of these styles can be found in the work of each of these masters. Their portraits are pervaded by a general poetic mood, an admiration for the beauty of the human face and heartfelt emotions. Oil on canvas. 72x53.5 cm. The collection of eighteenth-century paintings in Tretyakov Gallery is one of the best of its kind in terms of quality. The first half of the nineteenth century produced a number of excellent portrait painters. Among them two first-rate figures can be distinguished: Karl Bryullov and Alexander Ivanov. One of the most famous creation of Alexander Ivanov is exposed in Tretyakov Gallery - it is "The Appearance of Christ to the People" (1837-1857). The powerful development of democratic and realistic tendencies in Russian painting of the 1860s and 1870s paved the way for the blossoming of the Itinerant's art in the 1880s. In the work of the greatest masters of the time, Ilya Repin and Vasily Surikov, the Itinerants' realism achieved the long-desired harmony of "truth" and "beauty". Vasily Surikov was also the greatest of all Russian historical painters. He was especially interested in the turning points of Russian history. His best canvases ( such as "The morning of the Execution of the Streltsy", 1881, the Tretyakov Gallery ) are devoted to events of the seventeenth century - a time of numerous revolts and broad popular movements. Among the masters of Russian painting of the last three decades of the nineteenth century the names of Victor Vasnetsov and Nikolay Gay should be noted. Victor Vasnetsov raised interest in Russian folklore by creating images from folk tales and heroic legends ( "Alyonushka", 1881, "Bogatyrs" are exposed at the Tretyakov Gallery ). In the late 1880s and early 1950s a large group of talented young painters emerged on the Russian art scene. These included Abram Arkhipov, Michail Vrubel, Konstantin Korovin, Mikhail Nesterov, Andrey Ryabushkin, and Valentin Serov. All or nearly all of them were pupils of their senior masters, the Itinerants and seemed to be the direct successors of their realistic tendencies. But the most important of this group of artists, K. Korovin , V. Serov, M. Vrubel, are known as untiring "seekers" of "untrodden" paths in art. 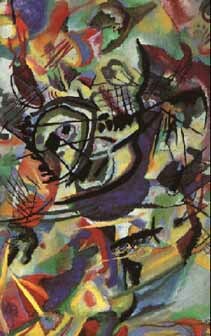 Radical changes began to occur in Russian art in the early twentieth century. A crisis hit the Itinerants movements, and along with it a crisis of Russian realism as a whole. Thus began the era of individualism in Russian art. The art of this period is represented fairly fully in the Tretyakov Gallery. Here one can find the most characteristic paintings and graphic works by a very influential group of artists that had united around the World of Art magazine: Alexander Benois, Konstantin Somov, Mstislav Dobuzhinsky, Evgeny Lanceray, Zinaida Serebryakova, Igor Grabar, Nikolay Roerich and others, with there refined stylistics and retrospective interest in European and Russian culture of the eighteenth century. There was the Blue Rose group and a related association, The Golden Fleece, which included Pavel Kuznetsov, Martirous Saryan, Nikolay Krylov, Kuzma Petrov-Vodkin and others who preached, at least in their early works, principles of poetic Symbolism introduced in Russian art by Victor Borisov-Musatov. Oil on canvas. 200x300 cm. The art of the young Russian avant-garde of the 1910s is also well represented at the Treryakov Gallery especially the most popular Jack of Diamonds group - Pyotr Konchalovsky, Ilya Mashkov, Aristarkh Lentulov, Robert Falk, Alexander Kuprin -as well as artists who had initially participated, the gone their own way: Mikhail Larionov, Natalia Goncharova, Mark Chagall, Vasily Kandinsky and Kazimir Malevich. The exhibition in the new annex of the Tretyakov Gallery on the Crimea embankment starts with art of the "developed" avant-garde of the 1920s and continues with art from the era of the rise and development of socialist realist ( 1930s-1950s and ensuing years ), art of the post-war period with the emergence within socialist realism of official and unofficial art, the new avant-garde, modernism and postmodernism. Both exhibitions are closely interrelated, providing an extremely full and broad picture of the evolution of Russian art from its roots to our day. is opened daily, except of Monday from 10 till 20 hours. Box-office is opened from 10.00 till 18.30.
museum address: Lavrushinsky alley 10.